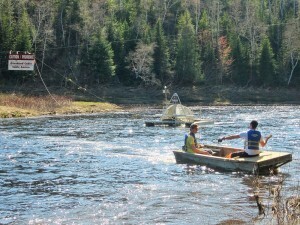 The MSA has conducted smolt population estimates on the Miramichi River for many years using a mark-recapture system. A mark-recapture study works by applying tags to a number of smolts at an upstream location using the smolt wheels (rotary screw traps), and then by using a recapture platform further downstream, you can count how many tagged versus untagged smolts are captured at this location and produce an estimate of how many smolts are leaving that river system. The Miramichi River needs approximately 1.8 million smolts (1.2 million from the SW branch and 600,000 from the NW branch) migrating to the ocean annually to support a healthy population. From 2001- 2010 we operated on the Southwest branch and had smolt wheels located at Rocky Brook, and on the Dungarvon and Cains Rivers (upstream tagging platforms), and used the DFO trap net, located in Millerton (downstream recapture platform), for this study. The results from these studies are available below. From 2011-2013 the smolt population estimate study was moved to the Northwest branch because of concerns regarding the declining adult returns to this river. Please see the link below for a more detailed description of the Northwest Smolt Estimate Study and our results. 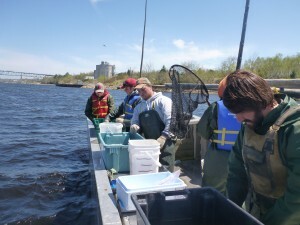 In 2014-2015 the smolt estimate study was expanded to encompass the entire Miramichi River (both branches) because of problems with washouts and freshets on the NW branch during the previous years' studies, which were giving inaccurate estimates. 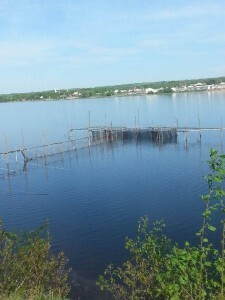 During these two years, four smolt wheels were installed on both branches of the Miramichi River: two on the Northwest (Trout Brook, and the mouth of the Sevogle) and two on the Southwest (Rocky Brook and the Cains). A new, larger trap net was constructed and installed near the Centennial Bridge on the Chatham side of the River as our recapture platform. The results from these studies are available below. 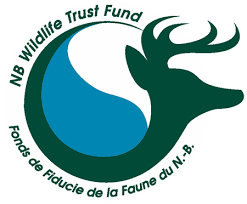 The MSA would like to thank the NB Wildlife Trust Fund for its support of the Miramichi River Smolt Program.